Alum Recognition | Will D.
As a student at Mississippi State University, Dr. Carpenter was an enthusiastic member of Kappa Sigma Fraternity. The national summer 2015 issue of the Kappa Sigma Alumni Updates included a complimentary article about Will, along with articles about other alums from all over the country. 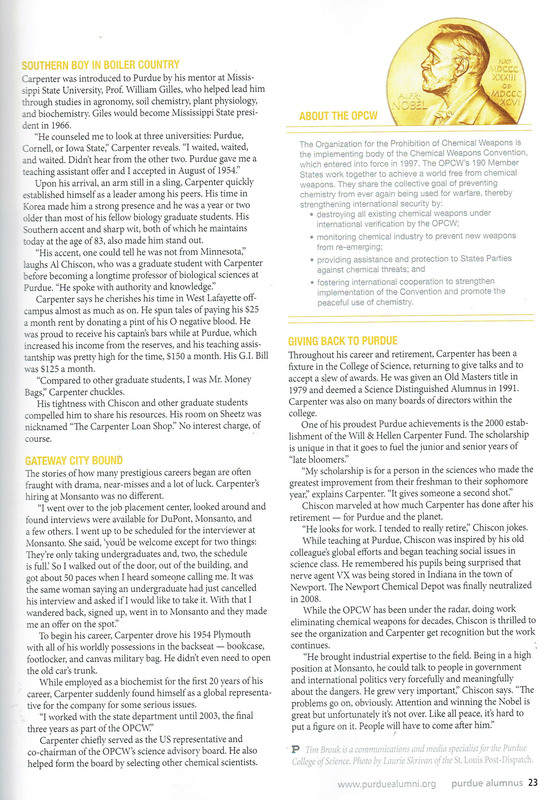 Having earned both a masters and a doctoral degree from Purdue University, Dr. Carpenter is also an active alum at that prestigious university, and was honored in their alumnus magazine with a marvelous article by Tim Brouk. 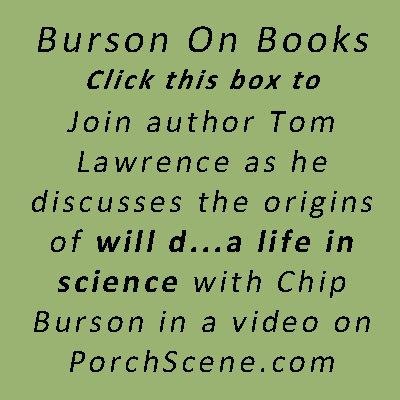 “will d…a life in science,” is a new book written about Will D. Carpenter. Dr. Carpenter is a 1952 graduate of Mississippi State, and a Kappa Sigma alumnus. During his three years at Mississippi State, he served Kappa Sigma as social chairman, rush chairman and Grand Procurator. After graduating from MSU with a B.S. in soil chemistry, he was commissioned as a second lieutenant, and served a tour in Korea as an artillery officer. 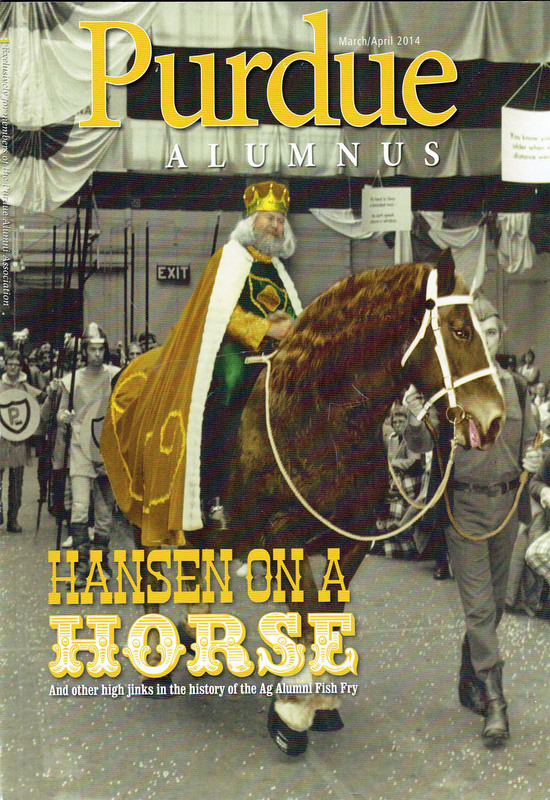 After his tour, he received his masters and doctoral degrees from Purdue University in plant physiology. Dr. Carpenter joined the Monsanto Company in 1958, in their product development division. During his 34 year career with Monsanto, Dr. Carpenter led the development team which commercialized Round-up, the world’s leading herbicide. Later in his career, Dr. Carpenter served as the lead spokesman for the Chemical Manufacturers Association during the negotiations that led to the signing and ratification fo the International Chemical Weapons Treaty. 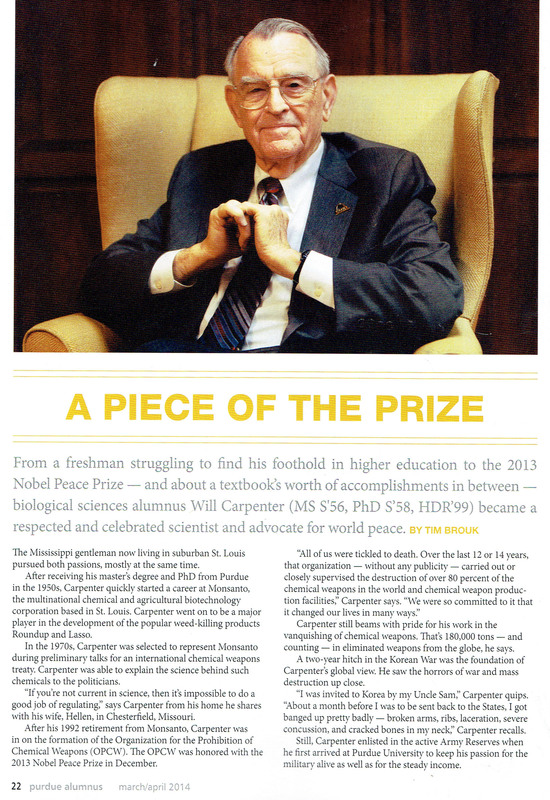 The Organization for the Prohibition of Chemical Weapons, on which Dr. Carpenter served as an advisor, recently received the Nobel Peace Prize. Dr. Carpenter has been honored by Mississippi State with an Honorary Doctorate and being named national alumnus of the year for 2003. In addition, he served as Mississippi State’s executive-in-residence for the College of Agriculture and Life Sciences and was also the college’s 1991 Alumni Fellow and 1997 alumnus of the year. Dr. Carpenter and his wife Hellen have given generously to Mississippi State, and have endowed several scholarships. Dr. Carpenter represents the finest example of everything for which Kappa Sigma stands. Additional information on Dr. Carpenter can be found at www.willdcarpenter.com.